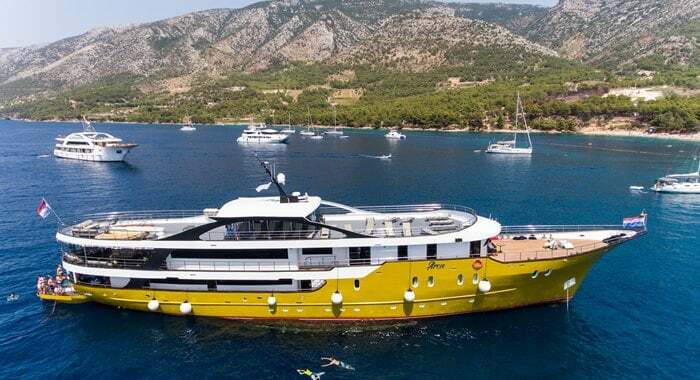 The 48.2m long MS Arca was launched in 2017, and features the latest state-of-the-art technology and amenities. The deluxe vessel boasts a maximum capacity of 38 passengers to ensure optimal cruising comfort. On the upper deck there are spacious public areas for relaxing and socialising. The elegant air-conditioned dining room features a buffet breakfast table and a LCD TV equipped bar. Also on deck, is a comfortable canopied lounge area. The 19 twin or double cabins include private en suite bathrooms. Launched in 2017, MS Equator is a 39m long luxury ship that accommodates a maximum of 38 guests. The ship boasts the latest state-of-the-art equipment and amenities and spaciously comfortable private and public areas. The 19 twin or double cabins are air-conditioned and include private en suite bathrooms. Located on the upper deck, is a spacious air-conditioned dining room with buffet breakfast table, and a bar area with LCD TV. From the comfort of the canopied exterior lounge, guests can enjoy spectacular views. The MS Desire made her maiden voyage in 2017. 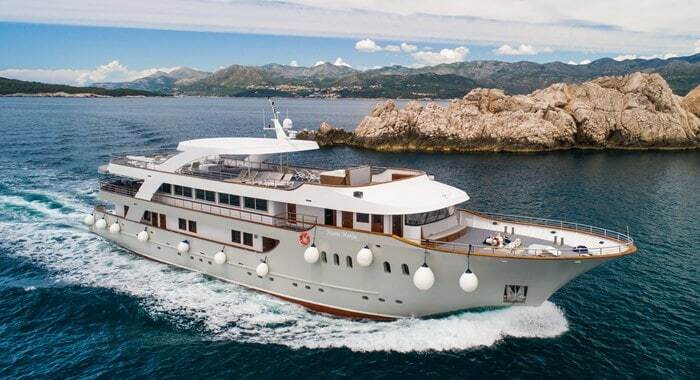 The 48.2m long luxury ship offers well-appointed accommodation and the latest state-of-the-art equipment and amenities. The vessel has maximum capacity of 38 guests. Situated on the upper deck, there is an elegant and spacious air-conditioned dining room with a LCD TV equipped bar and a buffet breakfast table. Outdoors the covered lounge area provides the perfect spot for relaxing. The 19 twin or double cabins are air-conditioned and include private en suite bathrooms. 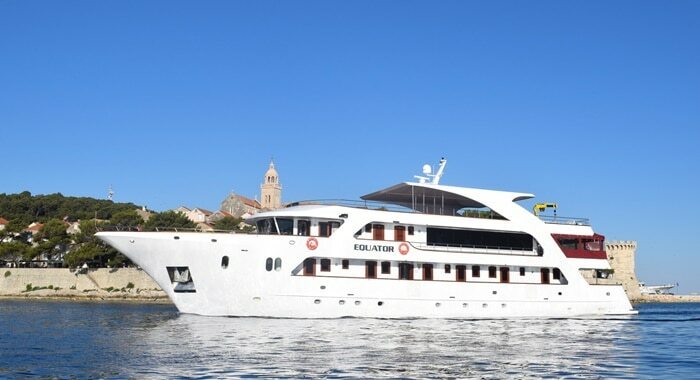 The MS Kapetan Bota is a luxurious 40.6m long cruise ship that is fully equipped with the latest state-of-the-art equipment, facilities and amenities, for comfortable sailing. The vessel has 18 well-appointed en suite twin or double cabins that are air-conditioned and can accommodate up to 38 guests. The public areas of the ship, located on the upper deck, include a spacious air-conditioned dining room with adjoining bar area and a buffet breakfast table, and an outdoor lounge that features a canopy. 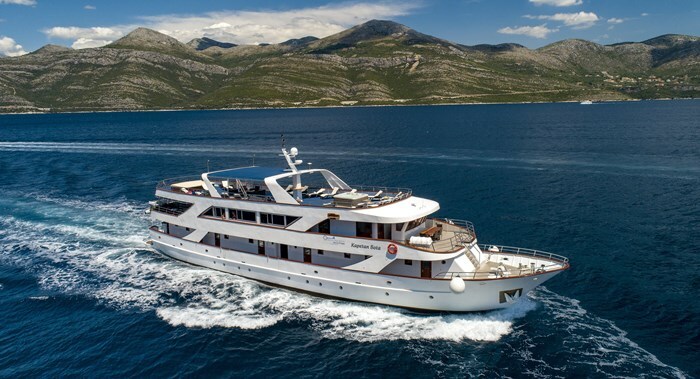 The MS Mama Marija is a modern deluxe vessel that features state-of-the-art technology and spacious public and private areas. The ship luxuriously accommodates up to 36 passengers, and is purpose built for comfort. The 18 air-conditioned twin and double cabins are arranged on the lower and main decks, and have private en suite bathrooms. On the main deck there is an elegant dining room and a comfy outdoor terrace area. The large sun deck boasts a relaxing Jacuzzi and plenty of reclining sun chairs. 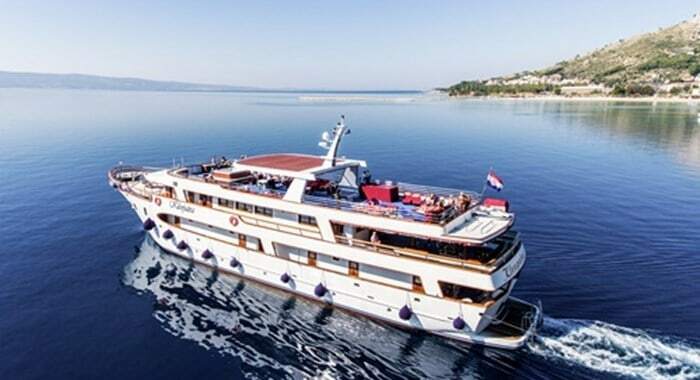 The 35m long MS Adriatic Queen was completely renovated in 2017. It offers the latest state-of-the-art equipment and deluxe amenities. To ensure optimal cruising comfort, the ship carries a maximum capacity of 30 passengers. Guests can relax in the 15 twin or double cabins that have private en suite bathrooms. On the upper deck, the public areas include a spacious air-conditioned dining room with LCD TV equipped bar area and a buffet breakfast table. There is also an exterior lounge with canopy. 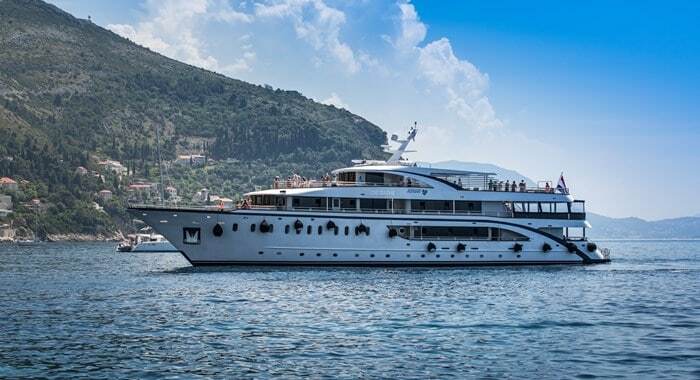 The deluxe MS Kleopatra is an elegant modern vessel that is fully equipped with the latest state-of-the art technology and a wealth of amenities. To enhance the luxurious comfort, the vessel boasts tropical iroko hardwood and mahogany on her decks. The ship has a maximum capacity of 38 guests. The 19 air-conditioned twin or double cabins feature private en suite facilities. Public areas include an elegant dining room with bar, and a large sun deck with sun loungers and a relaxing Jacuzzi. 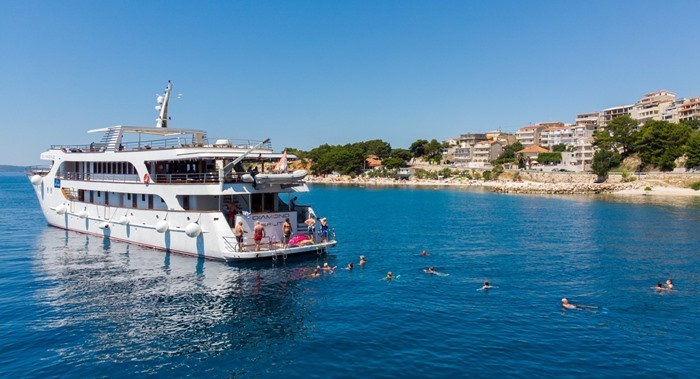 Built for the 2016 season, the MS Karizma is a modern luxury vessel that is designed to provide a supremely comfortable intimate cruising experience. The 19 air-conditioned, en suite cabins are arranged over two decks and provide spacious accommodation with plenty of amenities available. The public areas including an air-conditioned dining room with panoramic windows, and a bar that opens out onto a canopied outdoor terrace. There is also a sun deck and a swimming platform. The ship’s maximum capacity is 36 passengers. The MS New Star was launched for the 2018 cruising season, and boasts a new standard in cruising comfort. 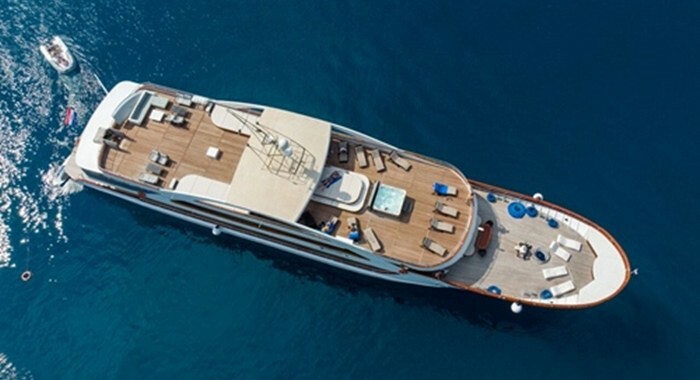 The luxury motor yacht has sleek lines and measures 46m in length. 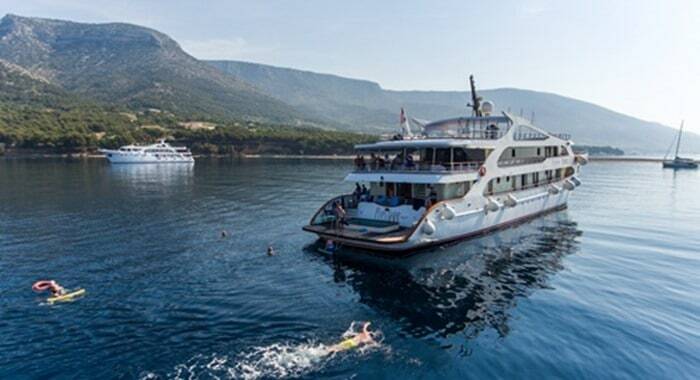 To ensure a superior cruising experience, the maximum capacity on board is 38 passengers. The 19 air-conditioned cabins are spacious and have private en suite bathrooms. The ship’s public areas include a stylish salon-restaurant with bar, and a large sun deck with a Jacuzzi and sun loungers. There is a swimming platform to the rear. Launched in 2012, the MV President is a superior yacht-like vessel that offers guests an unforgettable intimate cruise experience. Her compact dimensions allow her to directly access all ports of call. Carrying a maximum of 30 passengers, the ship offers first-class accommodation and spacious public areas. The air-conditioned cabins are arranged over two decks and include private en suite bathrooms. The large salon-restaurant has an adjoining bar that leads out onto a canopied terrace. There is also a well-equipped sun deck with plunge pool. The luxury MS Prestige is the sister ship of the MV President, and boasts state-of-the-art technology and amenities. The luxurious yacht-like cruiser comfortably accommodates up to 38 guests in spacious, air-conditioned twin and double cabins with en suite bathrooms. The elegant dining room has large windows, and a bar area that extends outwards onto a canopied terrace. The large sun deck offers plenty of sun loungers for relaxing, a shady area, and a plunge pool. To the rear of the ship is a swimming platform. 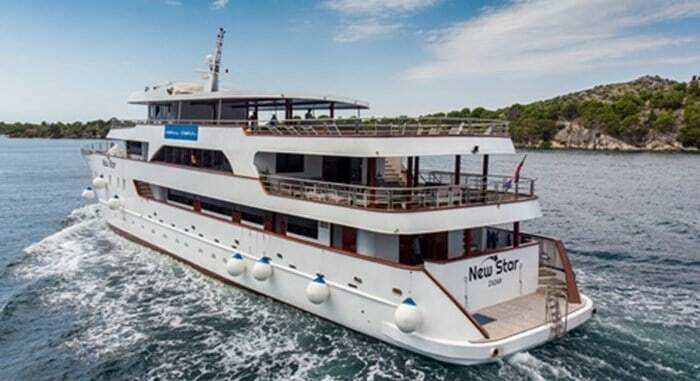 The modern MS New Star was launched for the 2018 cruising season, and boasts a new standard in cruising comfort. 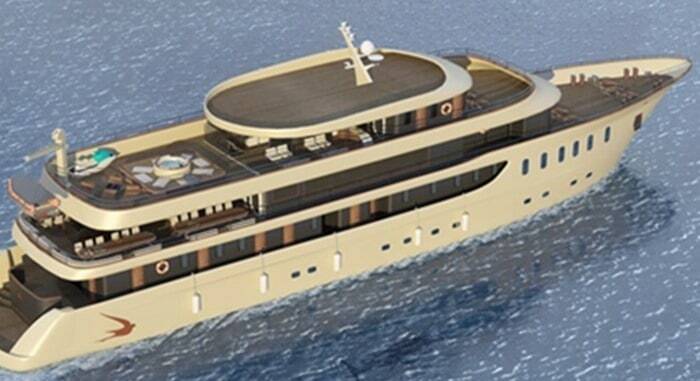 The luxury motor yacht has sleek lines and measures 46m in length. To ensure a superior cruising experience, the maximum capacity on board is 38 passengers. The 19 air-conditioned cabins are spacious and have private en suite bathrooms. The ship’s public areas include a stylish salon-restaurant with bar, and a large sun deck with a Jacuzzi and sun loungers. There is a swimming platform to the rear. Built for the 2019 cruising season, the MS Sea Swallow is an elegant luxury yacht that boasts the very latest safety features and state-of-the-art technology. The 18 well-appointed twin and double cabins are air-conditioned and have private en suite bathrooms. The luxurious, air-conditioned upper deck restaurant has a bar and a sumptuously comfortable 180-degree lounge area, where guests can relax and socialise. There is also a sun deck with a Jacuzzi and outdoor seating. A swimming platform offers access to the sea. The brand new MY Klara takes her maiden voyage in 2019. 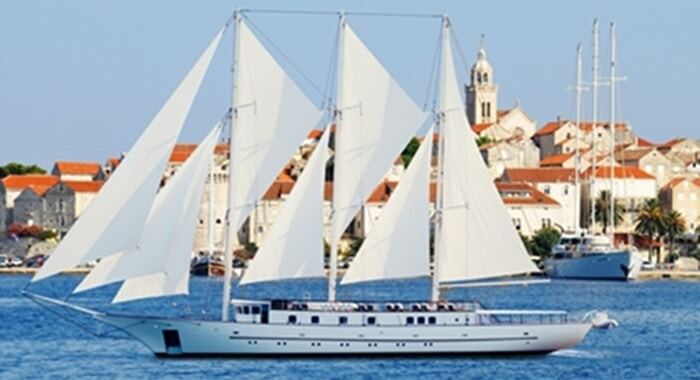 The sleek modern motor yacht is modelled on traditional three-mast schooners, and is designed to provide passengers with a superior cruising experience. Maximum capacity on board the vessel is 36 passengers. The air-conditioned en suite cabins are well-appointed and equipped with the latest amenities. The ship’s public areas include an elegant and spacious salon-restaurant with panoramic windows, a bar, and an outdoor lounge. A Jacuzzi is available on the sun deck. 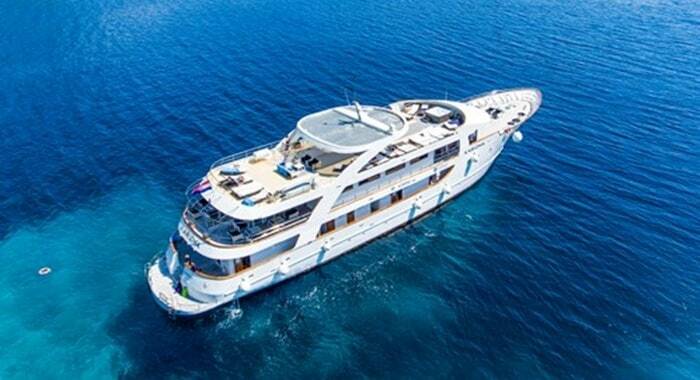 The luxury motor yacht MV Diamond comfortably accommodates up to 40 guests in 20 air-conditioned twin or double cabins. The 50 m vessel is fully equipped with the latest state-of-the-art safety features and amenities. Guests have access to spacious public areas, such as the elegant salon-restaurant and the outdoor lounge with comfortable sofa seating and tables. The large sun deck boasts sun loungers, deck chairs and a Jacuzzi for enhanced relaxation and there is a swimming platform with ladders that provide easy access to the sea.